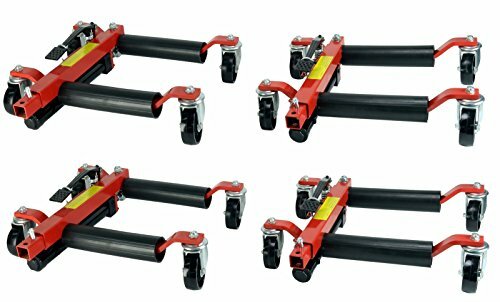 Four (4) Dragway Tools 12-inch hydraulic wheel dolly to easily move cars, trucks, trailers and boats around the garage or shop. Features 1,500 lbs. capacity and will hold up 22-inch wide tires. This set of two (2) hydraulic wheel dollies are designed to easily move any vehicle by pivoting with two dollies or freely moving with four dollies. Allows one person to move a three-ton vehicle with ease. One (1) year warranty against manufacturer defects. If you have any questions about this product by Dragway Tools, contact us by completing and submitting the form below. If you are looking for a specif part number, please include it with your message.